Whip Clear Wash I (120g)- Whipped cream like foam gently rinses away impurities, while replenishing essential moisture for normal to dry, sensitive skin. Re-stimulates the cardiovascular system. 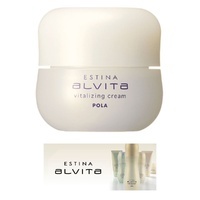 Vitalizing Lotion I (150ml)- Hydrating, refreshing lotion that delivers moisture, leaving skin supple. Vitalizing Milk I (80ml) ? ?Highly moisturising milk retains hydration while smoothing the skin?? surface. 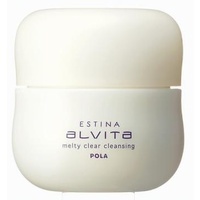 The moisture veil covers the skin and locks moisture in, while maintaining moisture balance without the greasy texture. 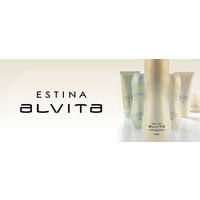 5 piece sample set containing Melty Clear Cleanser, Massage Cream, Vitalizing Lotion, Vitalizing Milk and Whip Clear Wash.
Estina Alvita is a skin care range that boosts the skin?? 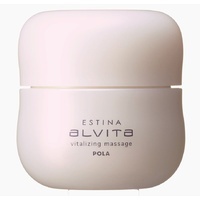 vitalizing force, which helps keep your skin looking radiant and glowing with health.